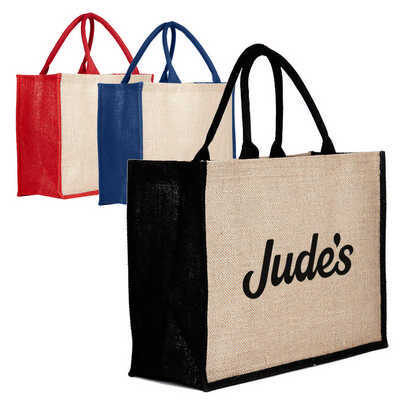 High quality environmentally friendly large laminated jute shopping bag in natural Colour with Coloured gusset and handles. With padded cotton handles. Seamed edges. Great promotional bag. Product Dimensions: Bag 420 mm W x 330 mm H x 150 mm D, handle 430 mm x 12 mm x 12 mm. Printing Area: 280 mm W x 220 mm H(front/back), 80 mm x 220 mm(gusset). Colour Range: natural/black, natural/red. Decoration Methods: Screen Printing, Digital Transfer. Price includes : 7 Days Lead Time Laser Engraved or Pad Printed. Setup is not included, please ask for a final price from your sales representative.